Cooper lands in the Big Apple to see his old friend, Phinney the Bear. Phinney takes Cooper throughout NYC to see the sights and learns why New York City is the greatest city in America. Their travels include Times Square, Central Park, Top of the Rock, a River Cruise, the American Museum of Natural History, Grand Central Terminal and several famous landmarks in between. Hunt through the book to find Cooper’s hidden secrets, or “buried bones”. Touch a picture and learn more about the story along with additional information and silliness. 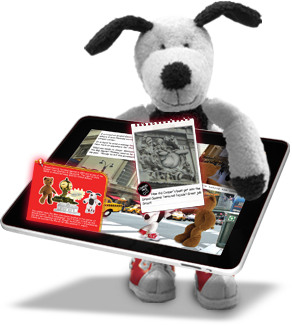 The book also includes an activity section detailing NYC’s interesting facts, history, maps and activities. By combining the rich imagery used in the print version of the books with an interactive “Where’s Waldo” type feature to see what Cooper hid, readers are guaranteed to enjoy their journey. New interactive elements include over 100 “buried bones”, animations, navigation and advanced fun fact information. Education and entertainment for children and adults alike!